October 2013: Tips, eNews & More! What a beautiful time of year! We Canadians spend too much time complaining about the weather! Right now feels just right! The leaves have changed, the days are a little shorter, but hopefully there's still a long way to go before the first snowfall. It's a great time of year to go on long hikes and bike rides. Around this time of year, we tend to turn to hot drinks like coffee, tea and hot chocolate to stay warm. While these delicious caffeinated drinks can give you an extra energy boost on these shorter days – and a warm feeling in your belly – they can also wreak havoc on your pearly whites! And don't fool yourself into thinking that adding cream or milk to your coffee or tea will not stain them any less! If your favourite warm autumn drinks are staining your teeth, contact us about tooth whitening options! Does your dental coverage renew each calendar year? If so, be sure to max out your benefits by making an appointment soon. Maybe you can use your remaining coverage to pay for the teeth whitening needed after indulging in all your favourite warm beverages! Talk to our office about your coverage to determine how to get the most out of your plan. Whether you're overdue or just want to get one more cleaning in before the year is out, book an appointment today! Despicable Me or Monsters Inc? Or maybe Heisenberg from Breaking Bad? It's that time again to start thinking about what to wear for Halloween! Avoid the temptation of month-long snacking by waiting until the end of the month to buy your candy. Your body and your teeth will appreciate the restraint! This year, Halloween falls on a Thursday, meaning that ghosts and goblins may be out during your commute home, so be extra careful when driving! Please note that our office will be closed on Thanksgiving Monday. We wish you a great Thanksgiving and a fun-filled Halloween! October 25th is our receptionist, Lisa's, birthday. If you're in the office on the 25th, join us in wishing Lisa a happy birthday! Congratulations to the winners of our Social Media Contest, Kiki Zigouris and David Dorsay. Enjoy your Oral B electric toothbrushes! November 15th is a PA day for both elementary and high school students, and Lawrence West Dental will be open! While the kids are free, consider having them in for a cleaning or check up. Please contact us immediately to book an appointment; we're bound to fill up fast! Looking for a night out...on us? Enter our Spoooky Fall Giveaway! Three winners will each win two Cineplex movie passes & dinner for two at Jetsun's Juicy Burger! 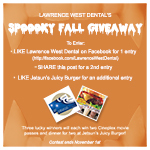 To enter: LIKE Lawrence West Dental on Facebook for one chance to win, SHARE our post on Facebook for one more entry, and LIKE Jetsun's Juicy Burger for an additional entry! You don't have to be a patient of Lawrence West Dental to enter. Share this newsletter and invite your friends, family, and colleagues to enter. The contest closes November 1st, and we will be announcing the winners on Facebook and in our November 2013 newsletter. Is Your Smile a 10/10? Is it a perfect TEN, a seven, or perhaps even lower? Does your smile make you look younger, sexier, and smarter? To read about the many ways that veneers can be used to improve your smile, click here. This month we have a delicious family favourite of Dr. Nick's!